Commissioned by the Canberra Classical Guitar Society in 2012, first performed by the Canberra Classical Guitar Society Orchestra in 2013, at their combined concert in Sydney. 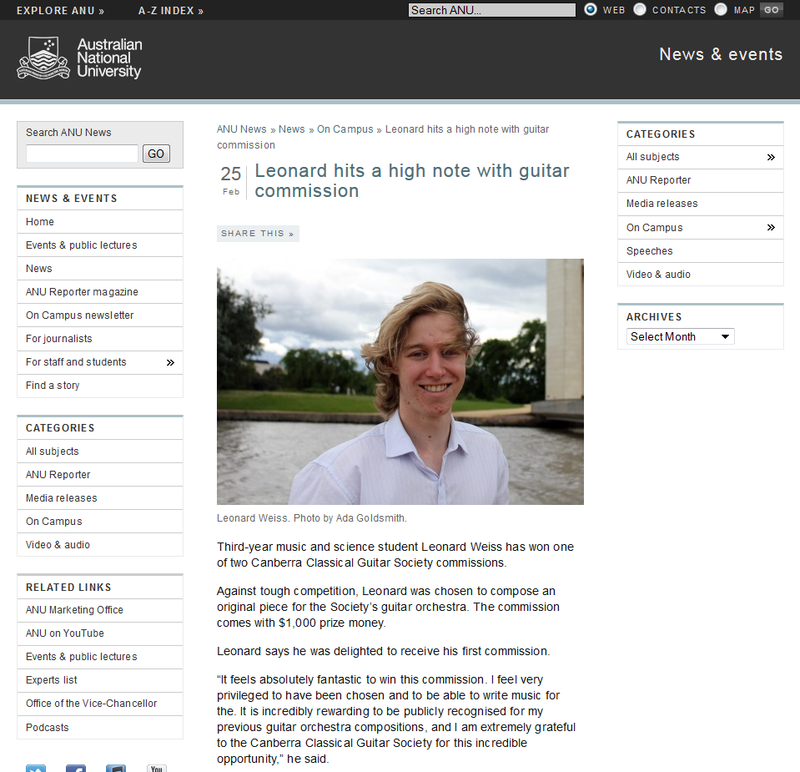 Excerpts of this work have been performed in a massed concert of 50 guitarists from the Canberra Grammar School. A master set of the score and parts is available for $40, with a 25% discount available to community music groups. The score and parts are available either physically (at no extra cost for shipping) or electronically as a PDF. Upon purchase, you have permission to perform the the work publically. You are able to print or copy as many parts as you need for the musicians in your organisation - if you are working in collaboration with another group or organisation, they are advised to purchase their own master set. Please contact Leonard if you are interested in purchasing scores. 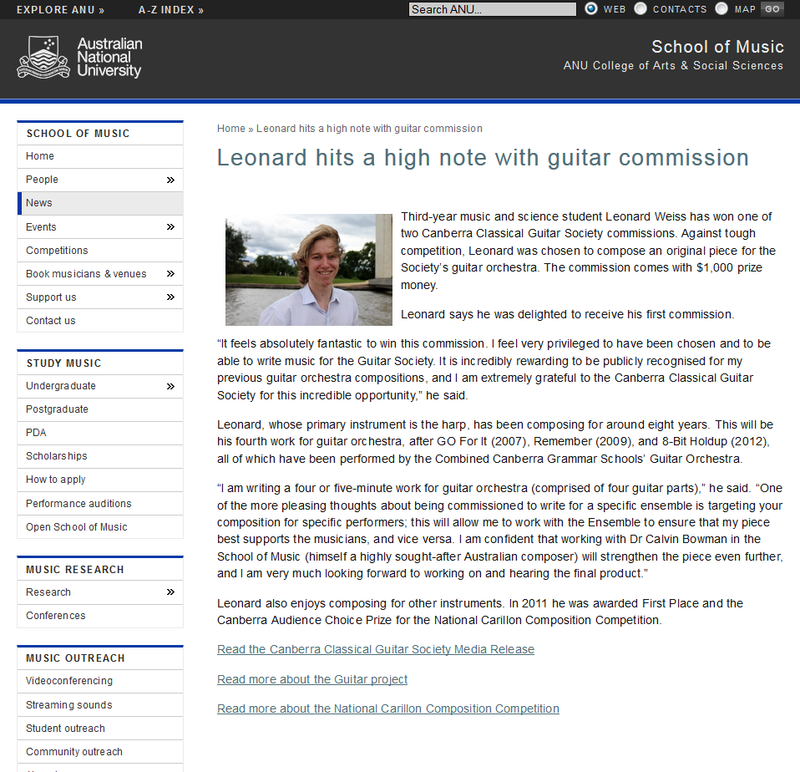 8-Bit Holdup has been performed by the Canberra Grammar School Guitar Orchestra in both Canberra and Perth, has been sold to and performed by the WA Classical Guitar Society Orchestra (view their performance), and has been sold to the Canberra Classical Guitar Society. This piece was written to imitate 'retro' 8-bit video game sounds with a soronous Guitar Orchestra or Guitar Quartet. Composed for the Combined Grammar Schools' Guitar Orchestra, this is a 2.5 minute work for 4-part guitar orchestra, with some 1st Guitars doubling on Requinto Guitar, pitched a perfect 4th higher than standard guitar tuning. Première conducted by Leonard Weiss. Composed for the Combined Grammar Schools' Guitar Orchestra, this is a 2 minute work for 4-part guitar orchestra. Première conducted by Leonard Weiss.